Take a look at the following peppers. Can you identify the defect from this picture? If you had said the pepper with the turning red color was the defect….I would have agreed with you. But, something changed. Sometime within the last few months “turning red color” (or full red color) on green hot peppers is no longer being interpreted as a defect. In March 2007 a new U.S. Standard was developed for Peppers Other Than Sweet. 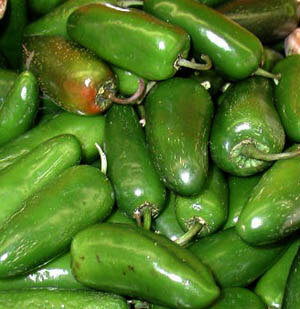 Whether it was an oversight, or an industry request, it is no longer a defect for green jalapenos, green anaheims, or green poblano peppers to be green. Give up on the defect? The defect shown in the picture is the scarring on the jalapenos. Yep, what most would consider a good sign of the pepper having some “heat” is actually now being called a defect. This post is filed under Grade Standards-Updates.